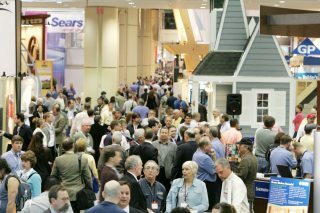 Experts at the International Builders’ Show in Florida predict a continued strong Northwest housing market. It’s been more than a month since I returned from the International Builders’ Show in Orlando, Fla., and I still find myself thinking about the TurboChef 30. There were more than 1,900 products on display at the show in the seemingly infinite Orange County Convention Center, yet it was a household appliance that captured my heart. TurboChef 30, you rock my world. And why not? Thanks to its patented technology, this baby can roast a chateaubriand in 20 minutes and bake a chocolate soufflé in only two minutes. Hello, rapidly expanding waistline! As I stood mesmerized by this oven-on-steroids, I thought about my boss back in Seattle. Clearly, he had sent me across the continent hoping that I would return with more information than how to cook a turkey at warp speed in a $6,000 oven. The International Builders’ Show attracted more than 100,000 people. I did pick up a few things along the way, of course. I learned that experts think the trend of ever-larger homes is ending. That new urbanism is not merely a fad. And that baby boomers might not want bigger homes, but they do want luxury gadgets in the abode. And, oh yes, the housing market. In a nutshell, you should count your lucky stars that you’re building in the Northwest. When I planned my trip, I really had hoped to get some insight on the market. I knew that we’re in great shape compared to the rest of the country, but I wanted some reassurance. Is the national industry recovering, or is it about to fly off another cliff? As with all things subjective, it depends on who’s talking. David Seiders, chief economist of the National Association of Home Builders, predicted that new-home sales will pick up in the coming year. Nationally, the industry built 400,000 homes too many over the last couple of years. That excess is slowly shrinking, and Seiders expects that housing starts will pick up in the second quarter of 2007. The economists’ presentation  with its emphasis on the East Coast and the South  was an exercise in patience. This is all interesting, I thought to myself, but what about the Northwest? They finally got to the meat of the matter and confirmed what we’ve been thinking all along: The Northwest is the exception to the doom and gloom. I straightened up in my chair when the economists sang the praises of Washington and Oregon’s strong job growth, which they said is driving people to move here and, in turn, keeping the housing market strong. Seattle is a standout not only economically, but also from a marketing standpoint. I concluded this later the same day when I attended the annual Sales and Marketing Awards. The sheer size of the International Builders’ Show, which attracted more than 103,000 people, is matched by the glitz and the ritz of the awards dinner. Called the Nationals for short, these awards are the Oscars of the home-building industry. There’s even a red-carpet walk. The only thing missing was an “Access Hollywood” reporter to comment on attendees’ sartorial choices. Seattle was well represented at the show. Opus Northwest’s Fifteen Twenty-One Second Avenue hauled home six Silvers and eight Regionals. Seattle’s one Gold went to Vulcan Inc.’s Alley24. With what I saw and heard in Orlando, my mind is at ease. Our market is robust, and the experts think the trend will continue. At this rate, I guess, we’ll have a chicken in every TurboChef 30. Marc Stiles is an account executive for Nyhus, a Seattle-based public relations and public affairs company. He previously was a reporter and columnist for the Seattle Daily Journal of Commerce.